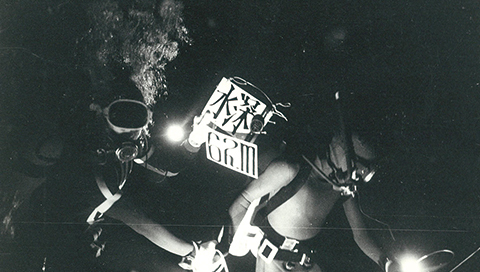 Old footage showing the present Ryusendo Cave entrance. The old entrance to Ryusendo Cave was located slightly higher up than the present entrance. Iwaizumi locals in those days seemed to enjoy a picnic party several times a year, with beer chilled in the clear stream close to the entrance. 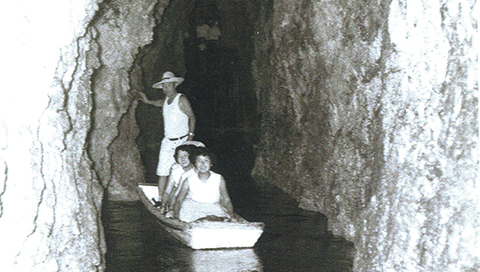 Before a boarded walkway was installed along the Hyakken Corridor, a boat was used to go deep inside the cave. In this photo, people are lowering the boat into the water. 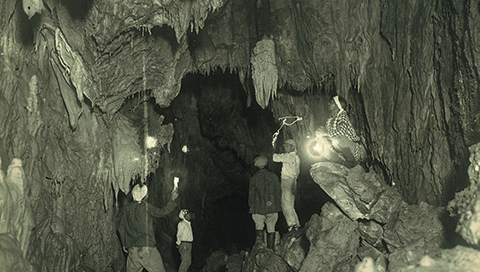 The landing place was near the Tamahibiki (Thundering) Waterfall, and keen young explorers carrying lanterns proceeded deep into the cave’s pitch-black interior. Travelling back and forth along the Hyakken Corridor, the boatman moved the boat along, not with oars, but by pushing against the rock by hand. During the Ryusendo Cave Festival, many visitors to the cave arrive by boat to the landing place, and some used hand lanterns to carry on farther into the interior. 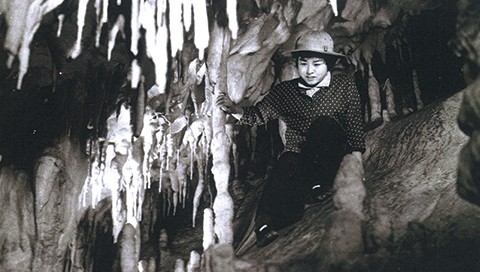 When Prince Mikasa’s visit to the town was announced, renovation work made it easier for him to walk through the cave. With more and more such events happening, Ryusendo gradually took on its present form. 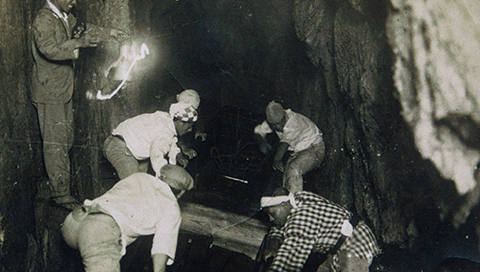 [Showa 43 (1968)]To open up the cave’s deep interior in time for the 1970 National Athletic Fall Meeting at Iwate, several works were undertaken – diving survey, development work in the deep interior, improved existing cave facilities, etc. This underwater photo was taken at the 62 m deep point of the Third Underground Lake. 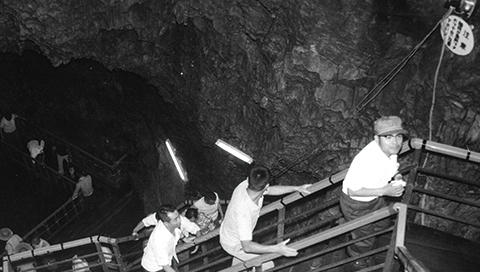 In the early days soon after Ryusendo Cave opened, the route would return back the original path after reaching the Third Underground Lake. With increased visitors it often became congesed. The solution was to install a new staircase to take visitors up from the Third Underground Lake to Miharatoge Pass. 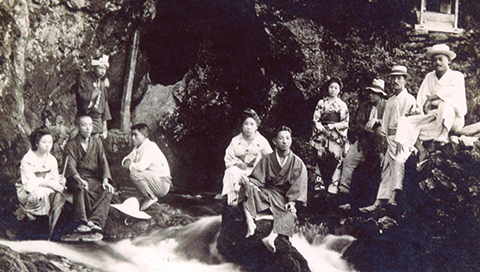 This tourism advertisement photo is from when Ryusendo Cave was known as the ”Ryusen-kutsu Cave”. This lady modeled for photos at various locations. A sappa boat (a type of small fishing boat) was made by nailing together wooden boards, and so the explorers could move against the current into the cave’s interior. 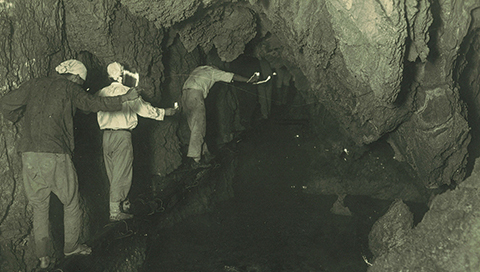 Then, on foot they went even farther into the cave, where they found bat holes. On August 18, 1930, an ”18 comrades” expedition was organized – inspired by the Japanese ”lucky number of 8” appearing three times (August was included, being the 8th month). Over the following nine days (19th – 28th), the cave then opened to the public, and the 546 visitors it drew generated big news coverage. 1-1 Aza Kannari, Iwaizumi, Iwaizumi Town, Shimohei District, Iwate Prefecture.